Jennifer Lopez is a woman of many talents; dancer, singer, actress, and business entrepreneur. Although over the past few years JLo has been looking a little over “done”. Has JLo been knocking on her plastic surgeons office a little to often. Let us know what you think! Jennifer Lopez is Made of Plastic! My what a difference a stylist, tan, and multiple plastic surgery procedures can make! American Idol judge Jennifer Lopez just burned through her third marriage and is looking hotter than ever before. What exactly is the 42 year old Jennifer doing to keep her so fresh faced, well to start with LOADS of botox! Upon comparing these before and after pictures we can safely say that the pop singer has had multiple plastic surgery procedures and injections. We estimate that she has had several procedures like Rhinoplasty, Blepharoplasty, and her Cheek Bones appear to be more contoured than in her earlier pictures. Each procedure has been done very tastefully and she does not appear overdone by any means. There is also some speculation that she had a lip reduction surgery, but we think that Jennifer’s lips look untouched and in her younger photos she may have used a broader outline with lip liner. What’s your opinion on all of JLo’s procedures? Is she taking it to far, or is the American Idol host looking better than ever? 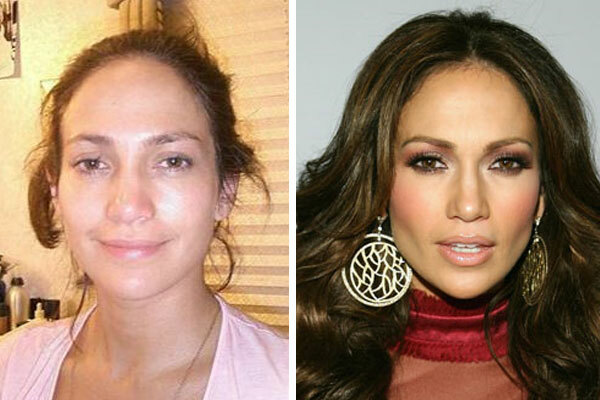 Here is a before and after picture of JLo without her her usual copious amount of makeup on. We must say she doesn’t look that bad, but you can really see the difference a little contorting makeup can make on her nose. Contorting makeup can work wonders on anyone’s face. The purpose of contorting makeup is to bring out certain features and downplay less attractive ones using shadows and highlights. All stars know this trick and use it to their benefit to hide imperfections and fake slimmer noses or higher cheekbones.